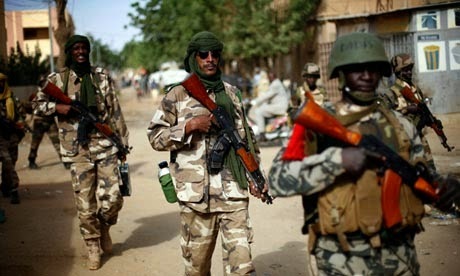 Soldiers from Chad killed 207 Boko Haram militants in fighting on Tuesday near a Nigerian town close to the border with Cameroon, Chad?s army announced in a statement. One Chadian soldier was killed and another nine were wounded in the clashes near Garambu, the scene of regular attacks by the Nigerian Islamist group in recent months. There was no immediate independent verification of the Chadian army?s announcement. Chad?s military also claimed to have seized large quantities of small arms and ammunition and two pick-up trucks. Niger, Cameroon and Chad have launched a regional military campaign to help Nigeria defeat the Boko Haram insurgency, which aims to carve an Islamic emirate out of northeastern Nigeria. Chad deployed troops last month in support of Cameroonian efforts to stop repeated cross-border raids by the Islamists, whose operations increasingly threaten Nigeria?s neighbors. The African Union last month authorized the creation of the regional force, which will also include Benin, and is pushing for a U.N. Security Council mandate for the operation.The African Union last month authorized the creation of the regional force, which will also include Benin, and is pushing for a U.N. Security Council mandate for the operation.